It’s been quite a number of years since US rapper Eve graced the ARIA singles charts with one of her own hits. She smashed it with 2001’s ‘Let Me Blow Your Mind’ (with Gwen Stefani on guest vocal) and did so again a year later with her Alicia Keys-featuring track ‘Gangsta Lovin’. She was last spied on guest vocal duty as part of Guy Sebastian’s No.1 hit ‘Who’s That Girl’. 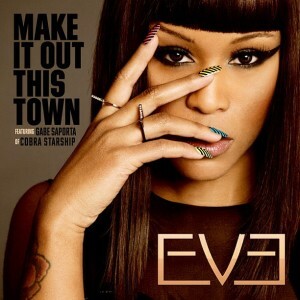 Now Eve is back in her own right, with Sony Music revealing the local release of her new single ‘Make It Out This Town’ (cover pictured) and the album ‘Lip Lock’. The album is set to feature guest performances from Snoop (in Dogg guise), along with Pusha T, Juicy J and Chrisette Michele. First single ‘Make It Out This Town’ features guest vocals by Gabe Saporta of Cobra Starship fame. It’s set for digital release on Friday March 29 – the same day the video is due to premiere on Vevo. ‘Lip Lock’ will make it to retail on Friday May 17. She’s been carried each time on her hit singles… Gwen Stefani, Alicia Keys and our own Guy. Can she have a hit on her own?